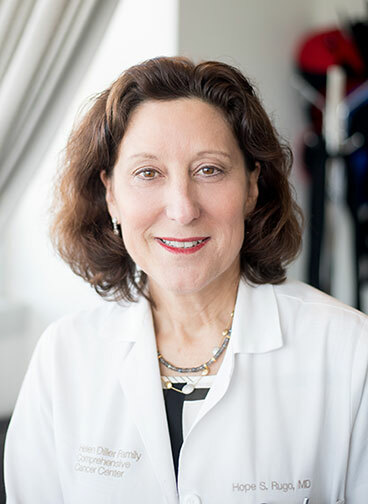 Hope S. Rugo, MD, Professor in the UC San Francisco’s Helen Diller Comprehensive Cancer Center and Director of the Breast Oncology and Clinical Trials Education is improving patient outcomes through personal experience. Rugo, who practiced as a hematologist for almost a decade, transitioned to breast oncology in 1999 after watching her mother, Faith Weil Rugo, pass away from a twelve-year battle to breast cancer in 1998. Faith Rugo was diagnosed with early stage cancer and developed the metastatic disease 10 years later, in 1992, so she moved from her hometown of Boston to San Francisco to live with her daughter. That same year, Dr. Rugo’s first child was born and she was in her second year as a faculty member at UCSF. For most of the next six years, Rugo would work full-time during the day as a hematologist. Then, she would go home and care for her two young children, and stay up all night caring for her mother. While Rugo said her residency experience made her familiar with staying up late, this time brought on amplified exhaustion, because of emotional trauma. Rugo said she did not have the proper support in understanding how to manage her mother’s illness and while the hospice care workers were helpful near the end of her mother’s life, it was still tough. In 1999, Rugo joined the UCSF Carol Franc Buck Breast Care Center as a medical oncologist, which she said has led to unbelievable career opportunities both nationally and internationally. Rugo has been at UCSF for 33 years, starting with her internship in internal medicine, and has filled her years as a faculty member with developing innovative treatments, groundbreaking research, mentoring students, career travel, and service to the Academic Senate. Rugo has served in the Senate since 2000. She has been on the Clinical Affairs Committee (CAC), finishing her service as Chair in 2015-2016. CAC reviews “policies and material regarding UC and UCSF Health that relate to or affect the academic mission of the University.” While serving as Chair, she played a pivotal role in providing input to the systemwide Academic Senate, who then made a recommendation to UC President Janet Napolitano on changing the governance of the Board of Regents Committee on Health Services. That recommendation was to select a clinician faculty member for representation, which was accepted and put into effect. Furthermore, Rugo has served on the Senate’s School of Medicine Faculty Council (SOM FC) since 2014 as a committee member. During the 2016-2017 academic year, the SOM FC advocated for an increase in faculty salaries, provided feedback to administration based on the results of the Mission Hall survey, improved communication between council members and their constituents, reviewed top-scoring applications for the Chancellor’s Fund Award, provided input on the 95% rule for NIH faculty funding, provided input on Diller Fund selection criteria, and addressed other issues. Despite her impressive track record, the talented oncologist’s focus remains on finding more ways to improve patient outcomes. A recent project that received national attention is scalp cooling caps, which can help reduce hair loss during chemotherapy. Scalp cooling caps first came to UCSF as a pilot study more than seven years ago after a number of patients expressed interest in hair preservation, with the goal of obtaining regulatory approval for these devices in the United States. UCSF uses the DigniCaps, which are made by Dignitana AB based out of Sweden. The DigniCap is made up of a silicone cap fitted to each patient’s head shape and connected to a cooling control unit. Then, a neoprene cap goes outside the silicone to keep it in place. The two caps are placed on the patient’s head 30 minutes before chemotherapy and 90-120 minutes after. The caps set to a temperature of 3 degrees Celsius (37 degrees Fahrenheit), with a two-degree adjustment window. Robin Spector-Salmans, RN, Breast Care Center Practice Nurse at the UCSF Carol Franc Buck Breast Care Center, who works with Rugo, said the DigniCap has helped patient’s self-esteem as well as sense of well-being. “When women lose their hair from breast cancer, it turns a personal experience into a public experience, often without meaning to,” Spector-Salmans said. One of Rugo’s colleagues, Michelle Melisko, MD, Associate Clinical Professor of Medicine in the UCSF School of Medicine’s Division of Hematology and Oncology, also played a role in transitioning to the DigniCap. Melisko, who is the Medical Director of Breast Cancer Survivorship Program at the Carol Franc Buck Breast Care Center, said the Helen Diller Family Comprehensive Cancer Center and others tested the DigniCap on 122 patients in a study that was published in the Journal of the American Medical Association (JAMA) on Feb. 14, 2017. Rugo led the study and brought the trial to the Food and Drug Administration (FDA), resulting in approval of this device for patients undergoing certain chemotherapy regimens in December 2015. The results showed that more than 66% of patients kept 50% or more of their hair during and following chemotherapy, as opposed to no patients keeping any hair without the use of cooling. While the caps do not prevent hair loss fully or in every circumstance, the majority of patients had minimal to moderate hair loss. Subsequently, a second device has obtained FDA approval; the UCSF project has led to national interest and enthusiasm for scalp cooling. The scalp cooling process led to the development of an international collaboration called “Chill,” whose goal is to gather research information and conduct an international registry with the hope to gain knowledge and further education about scalp cooling. Besides this effort, Rugo is working with her team on many other projects and research. Rugo said her research varies over time, because her interests are broad. Recently, her research has been on the treatment of metastatic breast cancer, targeting tumor biology, and managing toxicity. One such initiative is UCSF’s participation in the national Translational Breast Cancer Research Consortium, where Rugo is co-chair of the triple negative working group. Rugo has worked on a number of research projects throughout her career, two of which include a trastuzumab biosimilar trial and the multi-center I-SPY neoadjuvant therapy trial. Agents similar to biologic therapies are termed biosimilars and are much more complex than traditional generic medications. Biosimilars are a critical step in making biologic therapy more widely available and assuring that these new agents are both safe and have similar efficacy to the original biologic therapy. Rugo led a clinical trial with a generics company to develop an approved biosimilar of trastuzumab, which is an important antibody for a subset of breast cancers and results in significant cure rates. Initially, many pharmaceutical companies were advocating for a requirement to not allow biosimilars to be sold during the first six-months after receiving FDA approval. Recently, the Supreme Court overturned this ruling, so a waiting period is no longer required. Another research project Rugo is working on is a novel UCSF initiative termed I-SPY2 developed by Laura Esserman, MD, MBA, Director of the Carol Franc Buck Breast Care Center. Rugo serves as the chair of the safety committee for I-SPY2. This multicenter randomized phase II neoadjuvant trial tests novel agents as treatment before surgery for patients with high-risk breast cancer. The trial utilizes an adaptive design to treat more of the patients over time who are likely to benefit from a specific therapy, and includes both imaging and serial tumor biopsies. Early results have resulted in publications in the New England Journal of Medicine. The clinical team Rugo works with at the Breast Care Center is comprised of nine oncologists along with three breast oncology nurses and four nurse practitioners. At the Breast Care Center, teamwork is displayed in many ways, including: shared decision-making, the Advanced Breast Cancer (ABC) program, and the Breast Cancer Forum. First, shared decision-making helps patients understand the balance between risk and benefit, including toxicity and helps support patients during a time when they feel an intense loss of control. This is carried out in Decision Support Services, which allows the patient to verbalize questions in advance with the assistance of a staff member and provides a written and audio recording of their visit. Second, the ABC program, comprised of two physicians, a program coordinator, and a nurse help patients and their family with end-of-life decisions, medication management, symptom management, and helps patients cope living with metastatic disease. Mike Rabow, MD, Professor of Medicine in the UCSF School of Medicine, manages the program in collaboration with Dr. Rugo. Recently, the ABC program received grant funding from the UCSF “Give Breast Cancer the Boot” program, which is a fundraising event for breast cancer patients at the UCSF Helen Diller Family Comprehensive Cancer Center. Third, the Breast Cancer Forum takes place once every other month on Wednesday evenings. These forums feature guest speakers from within the UCSF community and is moderated by Dr. Rugo. They cover topics in patient friendly terms, and the forum is open to anyone who is interested in attending but is directed to patients and their families. Staff and pharmaceutical supporters also attend. Meeting topics include reviews of topical data, controversies, and a review of the most important presentations from annual meetings including the American Society of Clinical Oncology (ASCO) and San Antonio Breast Cancer meeting (SABCS). Podcasts of the event are available online in the resource center. Sarah Donahue, NP, UCSF Carol Franc Buck Breast Care Center, is newer to the center and said she has learned a lot from Rugo’s example. “Dr. Rugo helps not just treat a patient’s cancer, but also helps them move through an incredibly emotional journey,” Donahue said. Rugo is in the clinic for two full days or four half days a week, depending on work travel. Her clinic days last from 8:30 a.m. until sometimes late in the evening. Additionally, she mentors students, residents and fellows, and has intermittently taught portions of medical school classes, and formerly served on the committee that oversees medical school interviews. Rugo, a Boston native, attended Tufts University, for her undergraduate education. Following her graduation, she attended University of Pennsylvania for medical school with help from a two-year stipend from the National Health Service Corps. “During what would have been my fourth year of medical school, I decided to focus on global health by applying for a scholarship with the Henry Luce Foundation, which allowed me to live in the Philippines on the island of Mindanao,” Rugo said. That year Rugo was able to work with and train community health workers, travel throughout Asia, and meet many people who she keeps in touch with. Afterwards she did a rotation at the Royal Brompton Hospital in London and worked with other groups in occupational health in the U.S. Upon graduation from medical school in 1984, she moved to San Francisco for her residency in internal medicine and primary care. 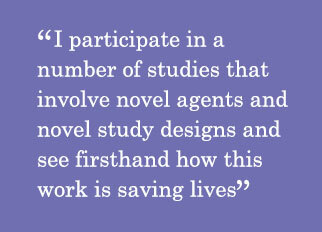 Following her residency, Rugo began a post-doctoral fellowship in hematology and oncology, which she completed in 1990. From 1988-1990 Rugo did laboratory research at Stanford University as a post-doctoral fellow in immunology. In 1990, she joined the UCSF Division of Hematology and Oncology as a faculty member in malignant hematology and bone marrow transplantation and transitioned to the Breast Cancer team nine years later. Rugo said there are many things about UCSF that keep her moving forward for the time she has been here. Created by UC Board of Regents Standing Order 105, the UC San Francisco (UCSF) Academic Senate is empowered to exercise direct control over such academic matters as admissions for degrees and curricula, which are of central importance to the University. The UCSF Division of Academic Senate provides an independent forum to discuss faculty-related campus wide academic concerns. In other areas, the Senate exercises an active advisory role. The Academic Senate works within the larger body of UCSF, a leading university dedicated to promoting health worldwide through advanced biomedical research, graduate-level education in the life sciences and health professions, and excellence in patient care.